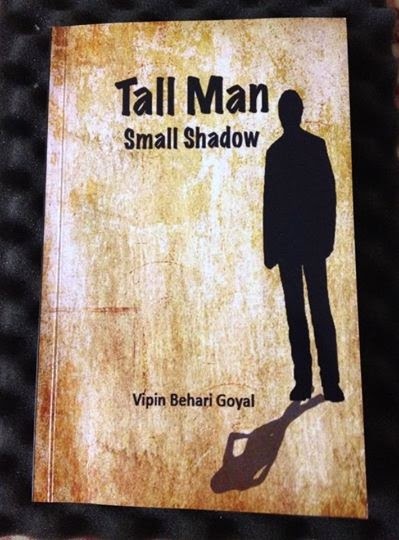 When the author of ‘Tall Man Small Shadow’, Vipin Behari Goyal, approached me for a review, he asked me to pick any book from the ones he had written. I picked this, his debut novel in English, and primarily because the introduction promised it was based on existentialism, that being my favourite theory ever since I studied it – to explain or to explain away my life’s happenings. Or my mind’s. The book centres on Anupam, the narrator, who enjoys his moments of solitude under a jacaranda tree, coining existentialist philosophies from mundane things that happen to him. All other characters – his ailing wife Sulekha, marriageable daughter Aalya, her Literature professor Seema, a single neighbour Salil – form a part of a story the opining narrator of which remains Anupam. In this short tale, we see a failed attempt at suicide, a secret love affair and a lesbian relationship, IVF, a marriage, an untimely accident and after a series of chance events an actual “divine” coincidence. Only later is revealed the invisible hand which was manipulating the story forward, making us re-examine past events from this character’s point of view. An interesting twist and turning around a philosophical premise. I liked sitting with Anupam on his favourite bench, seeing him marry the everyday with high philosophy. His questions addressed to himself vary from interesting to intense. An injured worm falls on his forehead from the tree above and he muses on the purpose of the worm’s life, one which escaped the bird’s beak only to fall into the hands of another who wonders what to do with it and ‘what right do I have to stand between a predator and its prey?’ Takes you to the age-old debate of free will versus fate. He believes ‘it is good to pray even if you don’t believe in God’ and constantly delves into the meaning of life (the predominantly existentialist tinge). How is it different from the objective of life? Or how similar to the reason behind life? While life’s meaning eludes his mind, he supports suicide; ‘When a state makes no effort to make me happy how can it compel me to live a sad life?’ stemming from Salil’s history. ‘What about my choice to make my own value system and moral code?’ he asks after reading the morning papers, calling the state’s definitions of crimes against the state ambiguous. Supporting an individual’s will over that of governments. And then, the quintessential truth and beauty of ideas, and that ‘some naked bitter truths that people find repulsive are also beautiful to me. Such truth is necessary for existence’. His last session on his ‘diamond throne’ under the tree is a chapter where ‘I sought wisdom with great intensity, and five trees and two birds could make me see what I never saw before.’ Made me see something novel too! Apart from solitary reaping, the author’s thinking mind reflects equally well in the Title of the book, as well as the myriad forms that Aalya’s ‘shadow’ takes in Salil’s eyes as the book proceeds. The fulcrum remains – ‘The shadow is positive; it’s not the absence of something. It’s an effect of the cause; it’s not a part of the object … her mind is conditioned, her shadow is unconditioned’. How Salil works out his own life’s lessons, to do with love and relationships, around Aalya’s shadow is interesting to read. Unfortunately, while the moments of philosophizing stood out, the rest of the aspects – the story, the language, the characterization and a spoiler in the form of Editor’s Foreword (which tells us the whole story, as well as what to think of it) failed to leave a mark. Let me be specific. There is nothing spectacular about the plot. A linear sequence of a handful of incidents spread over a couple of years. And, there is nothing interesting about the story-line either. In fact, the story could just as well have been written as a short story. In that medium, the ‘twist’ at the end of the tale would have come across as more effective. The philosophy under the jacaranda tree was a saving grace for me. Then, characterization. I liked how the book began, with each chapter dedicated to a character and his/her thoughts. I thought the characters will be shaped through their individual thoughts being shared directly with the readers. However, except at a few points, the over-arching (sometimes judgmental) narrator feeds us what to think about them, just like the Editor’s Foreword. Thus, the characters don’t grow to become individuals, or even well-rounded caricatures. Except Anupam, but then he is the narrator and the one talking the most. And language. The author is full of interesting ideas to express, philosophy to share and great analogies to create out of everyday living. But the use of language fails him, and vice versa. The book shows a lack of writing skill (which affects expression) and even, and most disturbingly, a knowledge of basic grammar. Tenses change from line to line, the narrative from first person to second all too suddenly and articles play peek-a-boo, to name a few problems. It takes away, hugely, from enjoying the book. ‘Tall Man Small Shadow’ will, at some points, give you moments of philosophical delight, as I have amply shown. But other than that, I wish the novel carried a better narrative, plot and characterization to come together as a whole. And for those who judge a book by the language, this may not be the most satisfying read. In the present form, the book remains one with the right ideas but ultimately an attempt in the wrong medium of communication. Philosophy ruffles a few feathers but rest of the things take away the charm for me. Thanks for reading the review, Jas. Such a pity that the negatives seem to outweigh what might be the good things about the book. Tempted to ask you - do you ever feel compelled to leave a book midway? If yes, what might be the deal breaker for you? Brilliant and in depth analysis of the book, Sakshi. It seems, interesting though and it makes me remember the philosophy lecture. Does it deal with metaphysical also cause it's something that interest me a lot? If you mean metaphysical in the sense of fundamental questions to do with being, then yes, Vishal. I would say there are bits which might interest you, especially the questions the author poses to himself. Debut books are dicey, since the author is new in the field, still sorting out style, form and also finding his or her voice. The premise is interesting, almost Prufock-ian, "Let us go then you and I ..."
He's published many books before this, and all non-English and non-fiction. You are right when you say the premise is interesting, Ritu ma'am. I wish he used a medium more suitable to his comfort to express those ideas. I agree with you, Beloo. I would hold the publishing house at fault for printer's errors or edits where full stops, colons and commas are missing or misplaced. Usually, the editors are not supposed to teach you the language you are writing in - tenses, articles, incorrect syntax, change of speech, etc. But yes, Cyberwit.net did print this book, so I am assuming they found no problems with it, in case they read it at all. And if the editor's have to correct your language use to that large an extent, then, as I mention, you have chosen the wrong medium to write your novel in. If you read the book you will see what I mean. When I read/review a book, primarily I am reading an author's work, not a publishing house's. Thanks so much for reading, Seeta.